Updated 2/20/2019 The image featured above turned up on a dealer’s page with two other sheets (included in the thumbnails). All of them feature Takamine Tsukasa, the slightly more mature club member with well-developed wind power. Here she is carefully walking along what appears to be the top of a fence, “tightrope walking” with her arms spread wide to keep her balance. In her backpack there is a long rectangle sticking out, too narrow to be her elaborate wand. 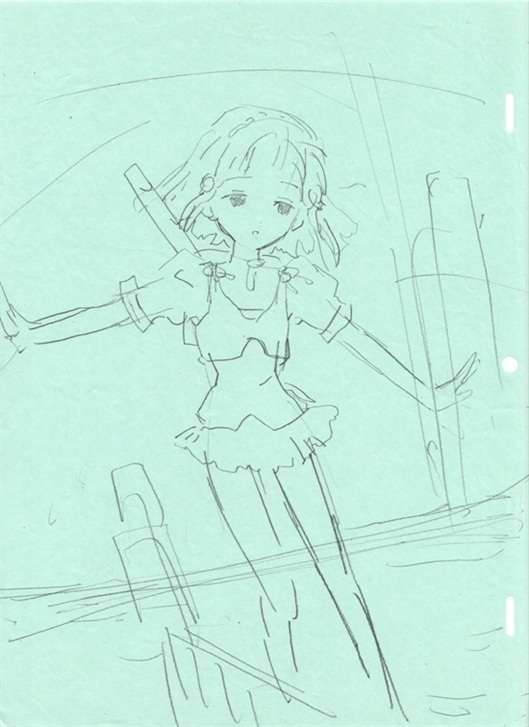 The first thumb adds another of the sketches, which show two such objects sticking out, with Tsukasa reaching back to grab both simultaneously. These suggest some kind of weapon, like the nunchucks (nunchaku) used in martial arts combat. That’s a tempting idea, but this placid, thoughtful character does not seem prone to this kind of violent action. 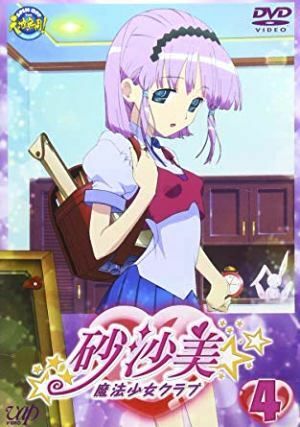 However, the cover art for volume 4 of the Japanese DVD release does show Tsukasa with a backpack, from which a long rectangular object sticks out, probably a slide rule in its case. So I suspect that this sketch, like the other two, is a preliminary study for a hanken made to be used in some form of series publicity. A search, has so far disclosed no commercial art that resembles any of these sketches. Perhaps these were trial drafts for images that were abandoned by the artist or rejected by the studio? Like the hanken draft I’ve obtained for Asatte no Hōkō, the three sketches are all executed in portrait mode on oversized animation paper made to be used in landscape mode. 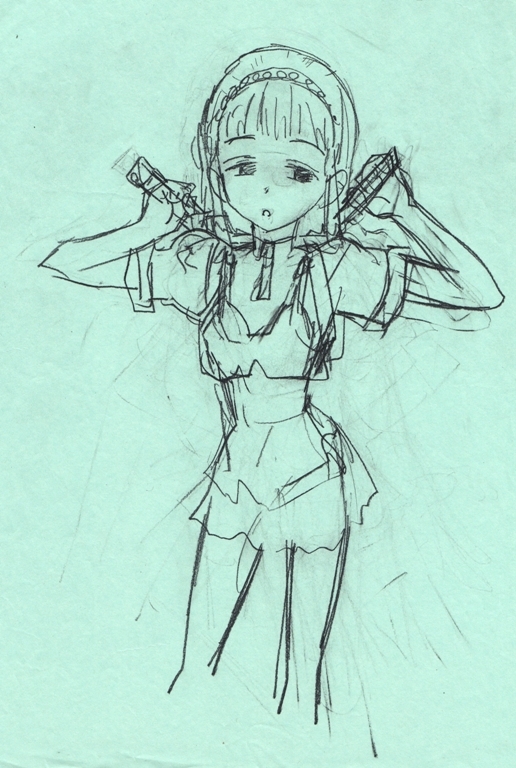 The “nunchucks” sketch in the first thumb, moreover, is like the Asatte no Hōkō hanken draft in showing multiple erasures, showing that the artist considered many different poses and details, then erased them and tried something else, again and again before abandoning the concept. The second thumb shows yet a third image of Tsukasa, clearer on the costume and accessories but weaker in putting across this character’s quiet but confident focus. She looks tired, maybe a little sick to her stomach. So I’ve featured the simpler but more successful “tightrope walking” sketch. At present I can’t confirm my guess that these are hanken studies, but if so, then they would likely be the work of character designer/chief animation director Shoji Hara. 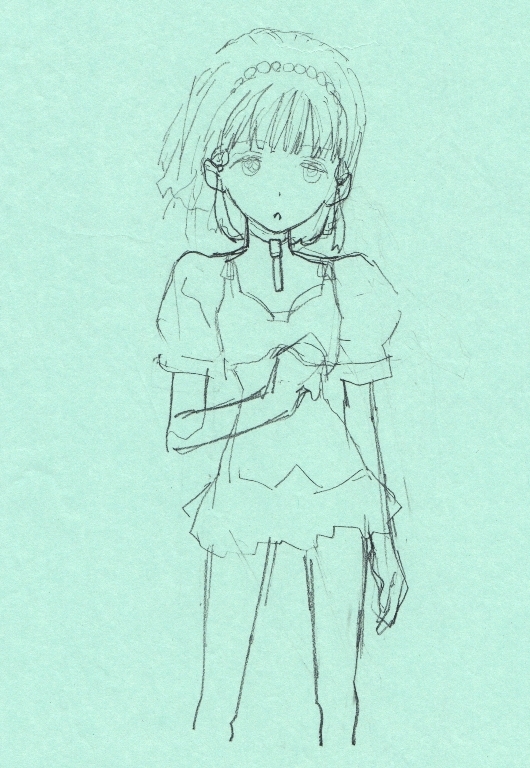 The style of sketching does resemble that see in some of the more preliminary settei sketches seen earlier in this gallery, especially the “Sailor-Moon-style” character seen in the previous item. The very preliminary sketch of this mystery character does seem very similar to the style seen in these three (particularly the one in the second thumb). And the "shuusei no shuusei" sketches for the Happy Misao cut in Ep. 25 (also likely by Hara) make yet another interesting comparison. In any case, with Sasami art very difficult to find these days, they are welcome additions to my collection.